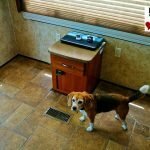 Experienced RVers know how important a level RV can be. Most RV fridges need to be level to run efficiently. But, beyond the fridge there are several other good reasons to get the rig nice and level. (1) All the doors in the rig won’t be swinging around wildly. (2) The plumbing and waste tanks will drain properly. (3) Your morning eggs will stay in the middle of the frying pan. (4) Walking around an unleveled RV can kind of give you a fun house effect. For many lucky folks nowadays rigs come with an automatic leveling system. With a touch of a button, hydraulic jacks automatically take care of the leveling. Must be nice. But, for the majority of trailer owners we are left to figuring out how to level our rigs manually. Usually, this is done with good old wood boards, plastic leveling blocks or ramps under the wheels on one side of the trailer and a bit of guess work using bubble levels as a reference. My wife and I acting as a team have gotten pretty good at it over the years. Even so, it’s often a bit of a chore getting things all leveled up at each new camp spot. We do a ton of boondocking so many times encounter challenging terrain. With that in mind, I found myself very intrigued when Larry from a company called ReVo Leveler (http://www.revoleveler.com) asked if I’d like to do an article on their product. 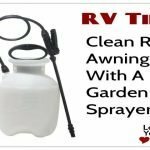 Being a fifth wheel owner and a certified RV Gadget geek, I said you bet! 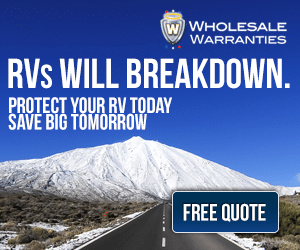 Note: A free promotional sample of the product was provided to Love Your RV! for this ReVo Leveler review. 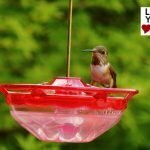 What Does the ReVo Leveler Do? 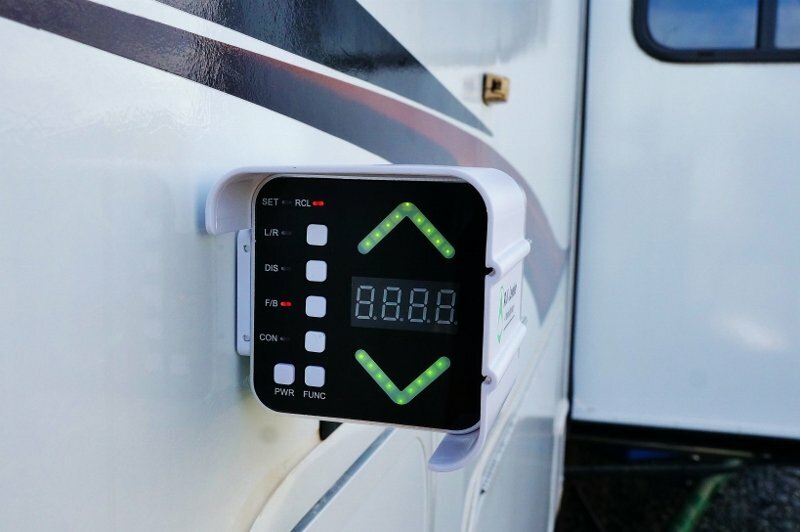 The ReVo Leveler is an electronic device designed to make accurately leveling your fifth wheel or bumper pull trailer much easier. It helps with four main adjustments we need when hooking/unhooking and leveling the trailer. The thickness of boards or ramp we need under the wheels to level our trailer side to side. The height we need to jack the trailer’s front up to disconnect our tow vehicle. The front jack adjustment up and down in order to level the rig front to back. The correct height the nose needs to be to reconnect the tow vehicle. 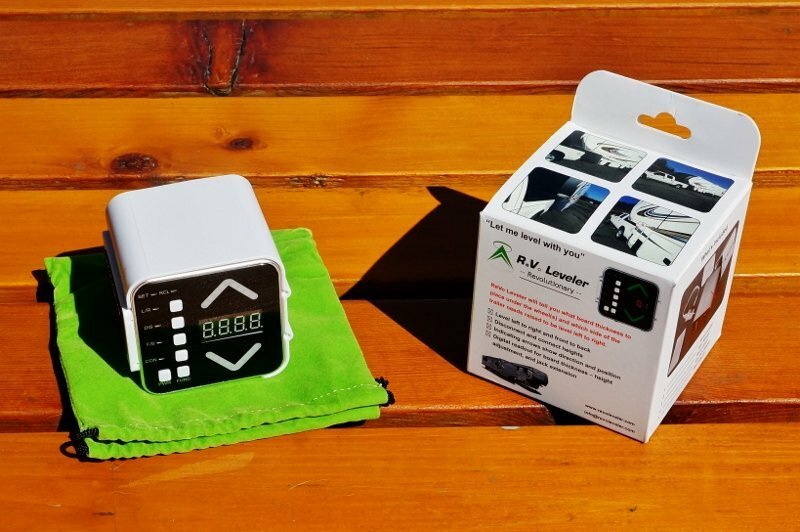 The device comes packaged in a graphically detailed little cardboard box about 4 inches square containing the Revo Leveler which measures about 3 inches square. Inside the back of the unit, there is a 12-volt cigarette lighter socket adapter and a short hookup cable. Also included is an instruction manual, two plastic mounts, a felt storage bag and several stickers with board inch heights marked on them. My initial impressions construction wise was very good. 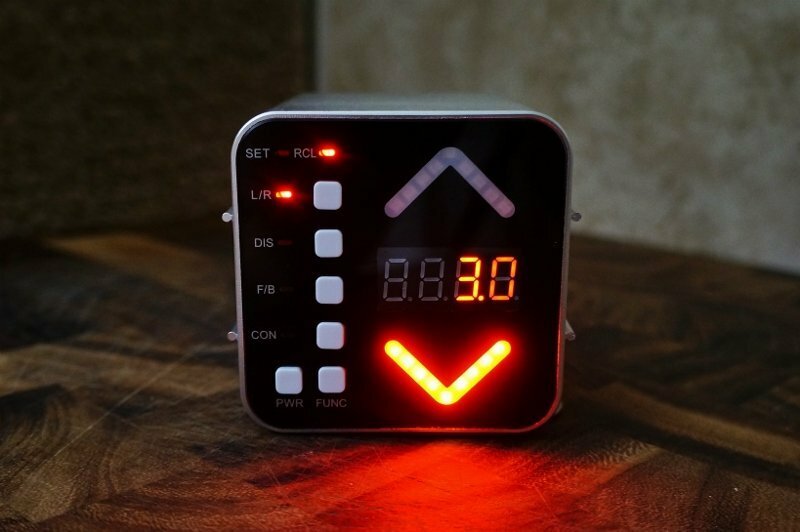 It’s well put together in a lightweight compact package with a slick looking display. You can tell some thought has gone into the “real world” usability with several smart features. First one is the power source. 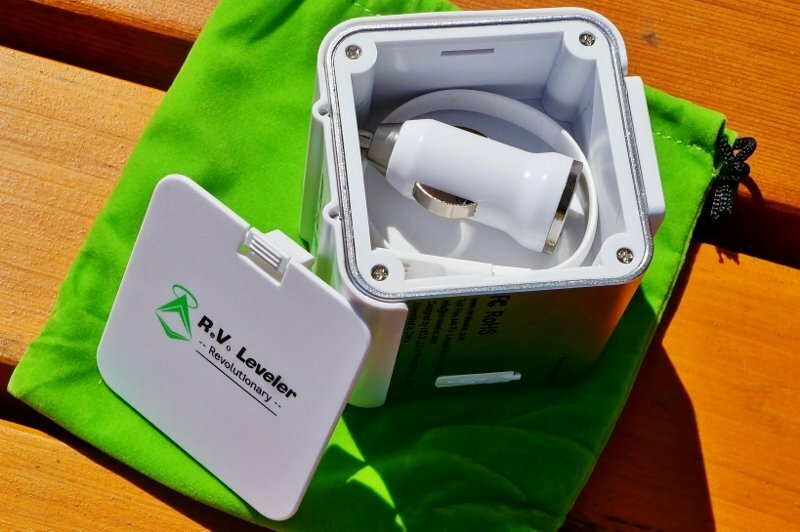 Rather than having to use disposable batteries the ReVo Leveler has a built-in rechargeable battery. 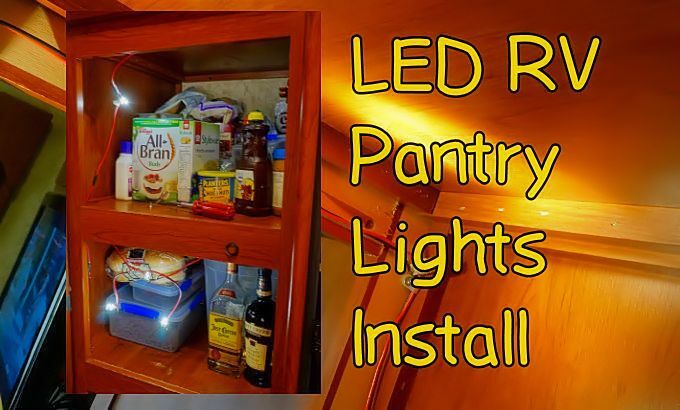 It includes a 12 volt lighter socket plug and small cable making it super convenient to recharge using the truck or RVs 12-volt outlets. 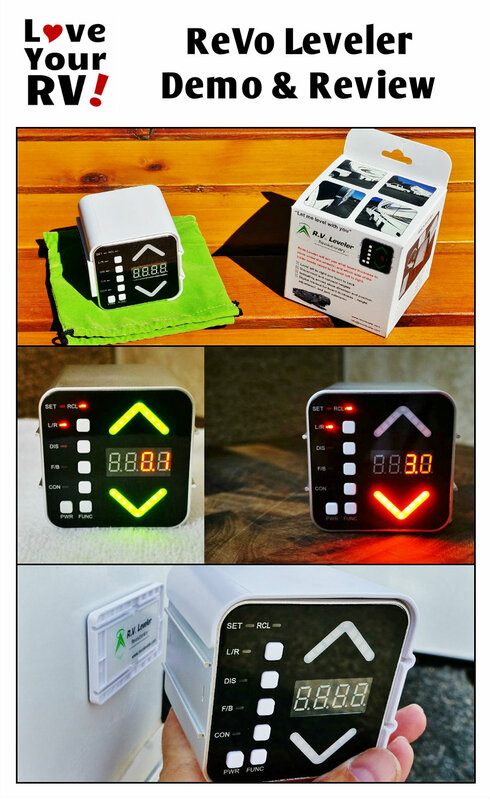 The manual states we can expect about 30 hours on a charge and the digital readout provides the percentage of charge remaining. 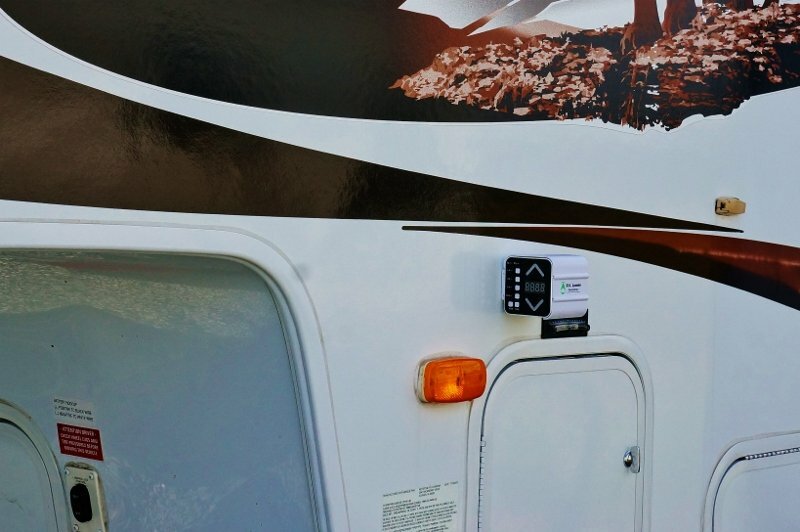 The second smart feature is the way it mounts onto the RV. 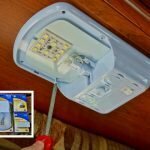 Instead of having to use screws and drill holes in our RV the small plastic mount they call a “nest” is adhered to the RV using a super sticky tape. I like that they know how much we hate to drill holes in our RVs. The third smart feature is a built-in sliding sunshade. 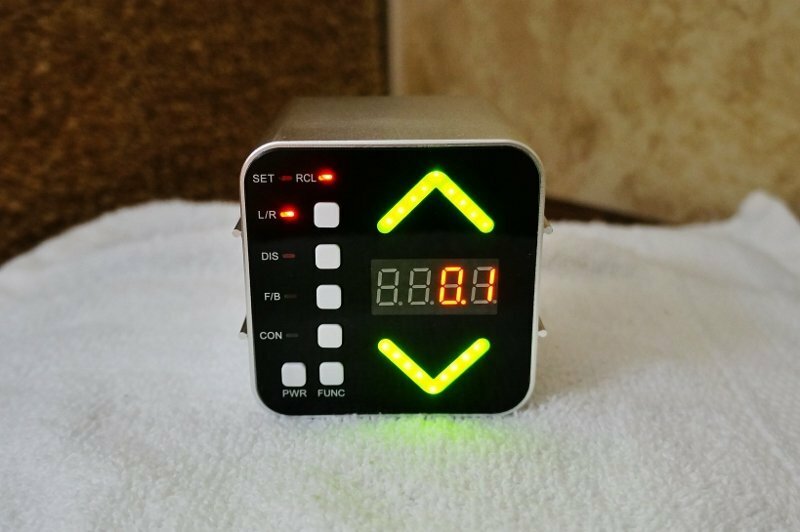 It fits snuggly alongside the unit and simple slides forward to shade the LED readouts for better readability on bright sunny days. The only negative reaction I had initially was to the perceived complexity of operation. At first glance with all the buttons and abbreviations on the front I figured it would be a little difficult to setup and use. My fears turned out to be unfounded, though. A little confusing at first but after a quick read through the manual and a visit to the website things became very clear. The website offers a bunch of videos explaining each and every function and how the thing works. I guess that’s smart feature number four, online video instructions. 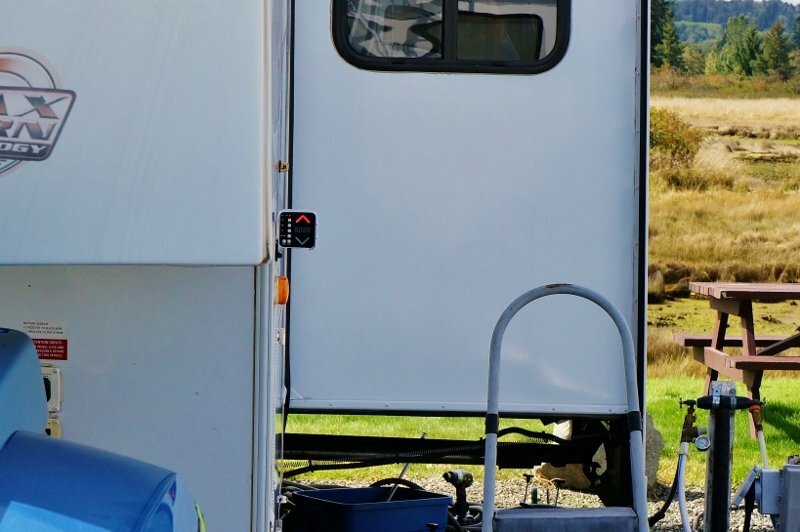 The unit is designed to be only attached to the trailer when using it. Otherwise, it is stored away out of the elements. It isn’t weatherproof. It comes with two small flat plastic mounts that the ReVo Leveler slides into when in use. One is for use on the driver’s side of the rig and one is for the passenger side, so you mount whichever place you prefer. I decided to locate mine on the driver’s side right near my front power jack control switch. I stuck it to the side of the rig at just about eye level in a spot visible from the trucks side mirror. 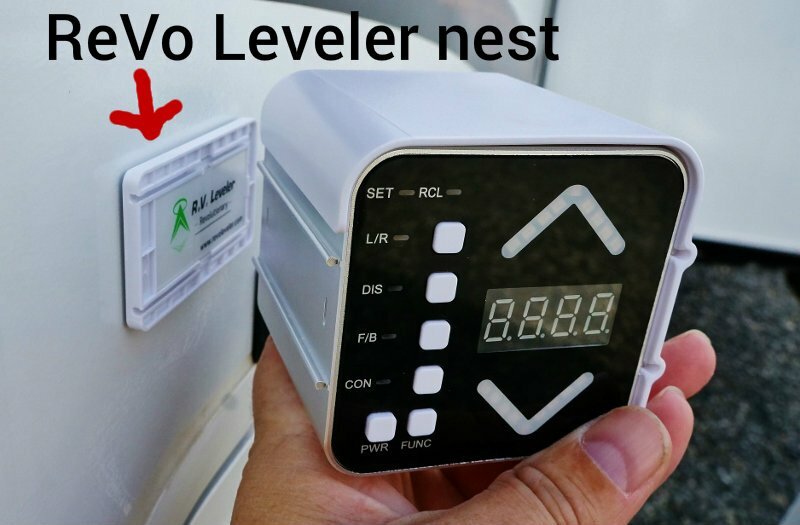 It’s not necessary for the mount or as it is called in the manual “the nest” to be perfectly level, the ReVo Leveler can compensate for it. When the ReVo Leveler is first turned on you are greeted with digital numbers indicating the current percentage charge remaining in the battery. 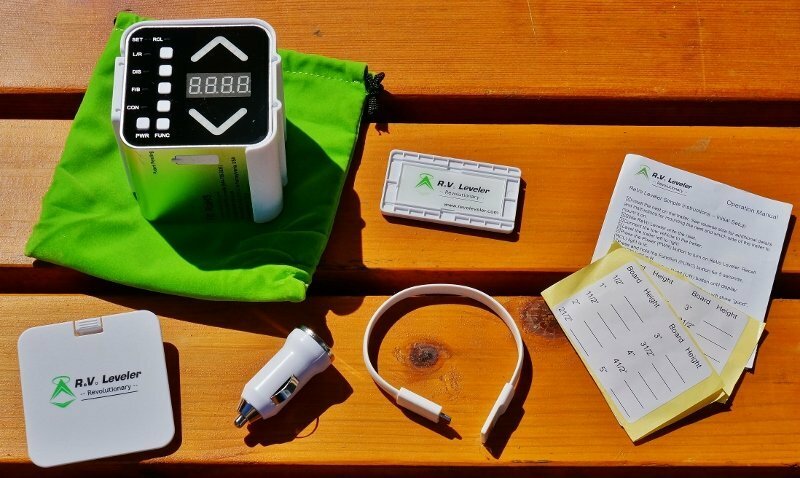 The first thing you need to do is set the device up to memorize your connect/disconnect heights and the front/back, left/right level points. Once those points have been entered into to the memory the device can now guide you to attaining these same trailer positions at a new campsite location. 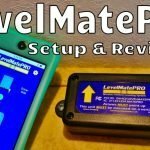 Check out the videos on the http://www.revoleveler.com for all the nitty gritty details, they also have the user manuals available for download. Every RVer seems to have their own definition of a level trailer. Some use a large bubble level on the front hitch or rear bumper, place a level in the fridge, water in the sink. Myself, I call the trailer level when the fridge door stays still when open and doesn’t try to shut or open further. The main feature of the display is two large up and down arrows. 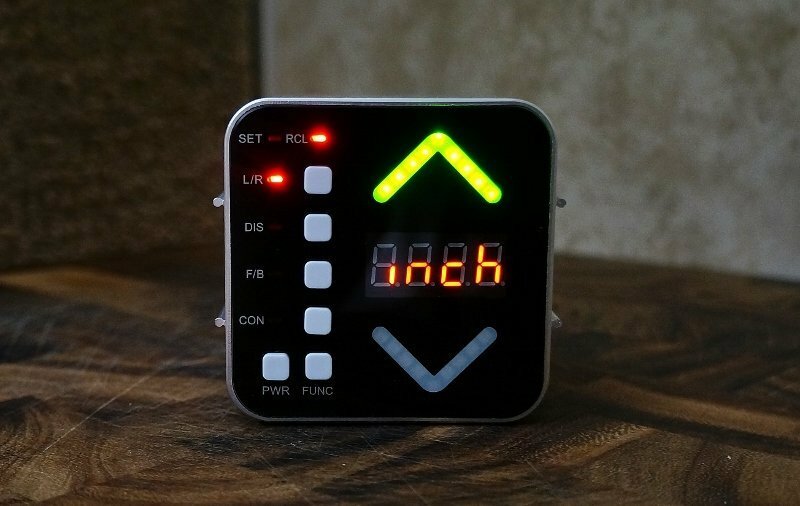 These super bright LED indicators start out as (up or down) red and then turn solid green when the desired position is reached. They are large enough to be seen from the tow vehicle, so it’s possible to make leveling the trailer a one person job. 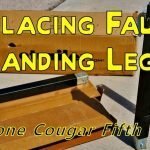 To do this, you would require some kind of homemade ramps or ideally a set of Anderson Camper Levelers. Guess what’s on my birthday list? When leveling side to side using basic leveling blocks or wood boards under both wheels the digital readout displays the inches of lift required and what side the trailer needs to be raised to achieve accurate level. Packed inside the ReVo Levelers box was an inch chart to fill out if you are the type of person that uses a block under only one wheel of a tandem axle trailer. The chart is to write down the amount of lift is provided using this method. You take the filled out chart and stick is on the top of the device for quick reference. A killer feature or me is the disconnect height readout. 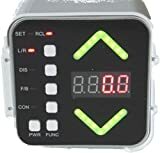 When you arrive at the potential camping site and use the disconnect button it will give you a red arrow either up or down plus a readout in inches. This will come in extremely handy for those super sloping sites where I’m going to need to have my jacks very much extended or very much retracted. This is a common situation in camp sites located on hilly terrain. Knowing ahead of time that I need say 10 or 15 inches of jack extension to level the trailer lets me plan how I use the inner jack sleeve and blocks when setting up my fifth wheel. There have been many times where I guesstimated wrong and had to re-hookup and try again. I found the ReVo Leveler to be a smartly designed, well-built product. It performed as billed in my tests. I think it will be a very handy little gadget, especially when I’m out boondocking in uneven terrain. 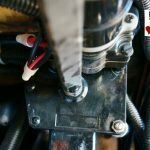 Reconnect fifth wheel pin height is always a bit of a guessing game for me, but now it should be a one step process. 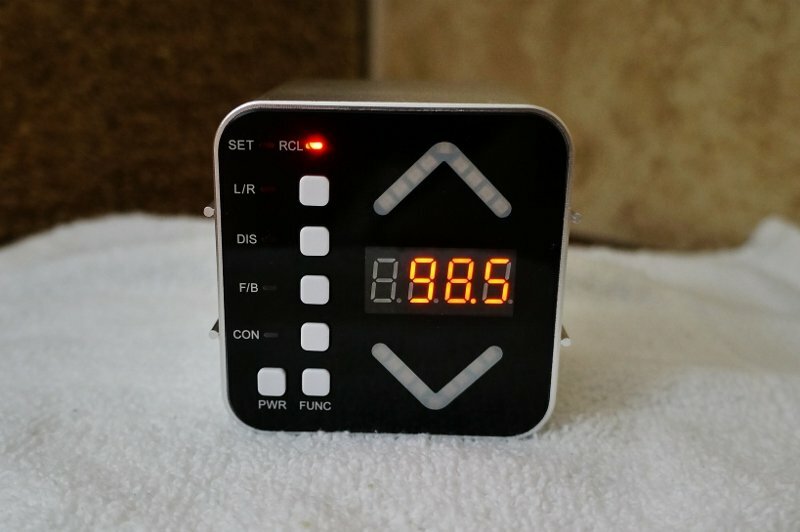 The only negative thing I found with the device was the LED numbers readout was a little hard to read in bright light. An LCD type display for this function may be a better bet. Newbie trailer owners should find the Revo Leveler extremely useful since they don’t have years of leveling experience to draw upon. I sometimes see it can be frustrating for them when the campsite is a little off level. This device makes getting the trailer accurately leveled a breeze. I give it a Love Your RV! thumbs up.